1. Preheat the oven to 200°C, gas mark 6. Simmer the quinoa in boiling water for 12 minutes. Drain well then toss with ½ tbsp coconut oil and a little lime juice. Season, spread out on a baking tray and roast for 15-20 minutes, turning halfway through. 2. Meanwhile, heat the remaining 1 tbsp coconut oil in a large saucepan. Add the leeks, celery and a pinch of salt. Cover with a lid and sweat without colouring for 10 minutes, stirring occasionally. Tip in the broccoli and sauté for 8 minutes, then add the stock and 250ml water. Bring to the boil and simmer gently for 5 minutes. Stir in the peas, simmer for another 2 minutes, then set aside to cool for 10 minutes. 3. Whizz the soup in a blender with the dill, coconut milk yogurt and a splash more lime juice until smooth. Add a little water to loosen if needed. 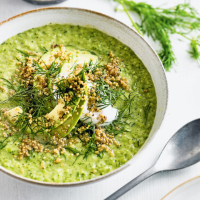 Serve in bowls topped with the quinoa, sliced avocado, extra dill and extra coconut yogurt.